We had a great weekend! Thank you for praying for the ministries here in Cambodia. We received a good report from the church in Prey Bang village. Several new adults are starting to be faithful. They also reported having a good group of children present for the children’s service. Please continue to pray for Bro. Keo and his family, Bro. Sinath and his family, and Bro. Ra as they travel two hours one way twice each week to minister to the folks in Prey Bang. Our adult and children’s services services in Phnom Penh were crowded and had a great spirit about them as well. It was a blessing to have several first time adult visitors in the morning service. Among the visitors were four young adult women who are deaf. Grace and Sina have been reaching out to them for several weeks and seeking to communicate the gospel to them. They seemed to be so happy to be at church. I was so pleased with our people for welcoming them and helping them to feel at home. Those who are physically disabled tend to experience quite a bit of discrimination in this culture. Though much of the discrimination is done subconsciously, it may actually stem, in part, from the belief in Karma and reincarnation. There is the belief that if you are wealthy, healthy, and educated it is because of the good deeds that you did in a “former life.” If you are poor, ill, or handicapped it is because of all the bad deeds you committed in your “former life.” Indeed the devil and his lies are cruel and those who are blinded by him have no hope. When I observe much of what goes on around me on a daily basis, I am reminded of Psalms 74:20 that says, “…for the dark places of the earth are full of the habitations of cruelty.” Thank God for the light of the gospel that shines abroad in the hearts of all those who have been freed from his power. During the preaching Grace sat with them in the back of the auditorium and attempted to use whatever sign language she knew as well as wrote key points on paper and showed it to them so they could understand some of the message. Debbie and I plan to visit them in their home this Thursday evening. Please pray that these four young ladies will understand their need of salvation and will be saved. Several of our teen girls attend a private school not far from our church. They have a godly testimony in their home, the community, and their school. It was a blessing to have one of their teachers visit the service Sunday morning. I had the opportunity to speak with her for awhile after the service. She is so impressed with their testimony for the Lord that she just had to come and see their church. We are very blessed by their example. It’s a funny thing – a couple of weeks ago the girls told me that the people at their school no longer refer to them by their individual names. 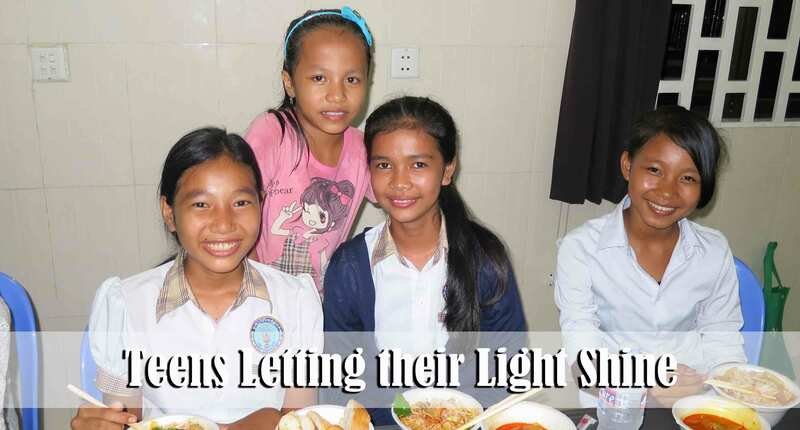 When they address them they refer to them, collectively, as “the Baptist people.” (ពួកបាទីស្ទ) Thank God for the light that shines forth through their lives. Please continue to pray for the teens in the four churches to be faithful. They have an unbelievable capacity to reach this land with the gospel if they will remain faithfully committed to the Lord! Samnang has been attending the Phnom Penh church for a little over a month now. He loves being here and seems to be making some friends. Please pray that Samnang will come to a place in his life where he is able to give a clear testimony of salvation. It was a blessing to be able to help celebrate Tina’s 12th birthday this week. During her birthday celebration she shared her testimony of salvation to all those where were present. There were around 50 or so folks who were invited to attend including a few unsaved relatives from the Cham village. Many of you have heard me tell Tina’s story. She is the young lady who accepted Christ here in Cambodia at the age of nine and refused to purchase alcohol for her father who, at the time, was working in Malaysia but was due to return to Cambodia very soon. She told her father that she was now a child of God and God did not want her to do that anymore. When she refused to buy the alcohol her father told her to go tell her Uncle Ra to purchase it and have it ready for his party once he arrived home. She then told her father that Uncle Ra had become a child of God also and she was sure he would not buy it either. 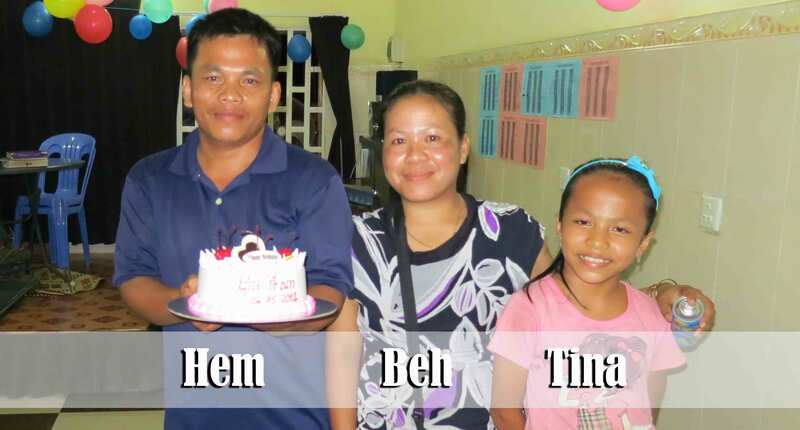 Tina was so burdened for the salvation of her father and mother that the night they were due to fly back to Cambodia she got up from bed 9 times to pray for their safe arrival. She begged God to not allow her parents to crash in the plane and go to Hell. It was because of her bold stand for the Lord and her burden for her parents that both her father and mother accepted Christ and are today faithfully serving the Lord. Please continue to pray for Tina, and the members of her extended family who have not yet accepted Christ. Last night I had the privilege of leading Hem in the sinner’s prayer. He came to Phnom Penh to join Tina’s birthday celebration. So many people played a part in seeing him saved. His wife, Soam, has been a wonderful testimony to him since the day she was saved. The believers who live in the Cham village have been faithfully witnessing to him. Bro. Keo and Bro. Sinath have on different occasions witnessed to him. I had the opportunity on a couple of occasions to speak with him at length regarding his need of salvation. We have known for several weeks that he was very close to being saved but there was one thing that prevented him from placing his faith in Christ – the fear of persecution from those who live in the village with him. Up until the past several months he has been one of those who persecuted Christians. I was told this morning by a lady who is nearly 30 years old that she remembers him ever since she was a young child. She told me that the entire village was scared of him because he would often become demon possessed and do crazy things. What caused him to be willing to joyfully place his faith in Jesus Christ were the events that he witnessed over the past several weeks as Srey Leak was being persecuted because of her decision to leave Islam and become a Christian. He observed the hatred and spite of the villagers but he also observed the love and compassion of the believers. The difference to him was as clear as night and day. He no longer feared becoming a child of God. In fact, he told me that he decided to accept Christ this past Thursday as Bro. Keo witnessed to him but wanted to wait to “pray” until he could meet with me Monday evening. I reviewed the plan of salvation with him and he assured me that was what he believed, and that he was fully trusting in the shed blood of Jesus to pay for his sins. We prayed a prayer of thanksgiving for the salvation that he already received! 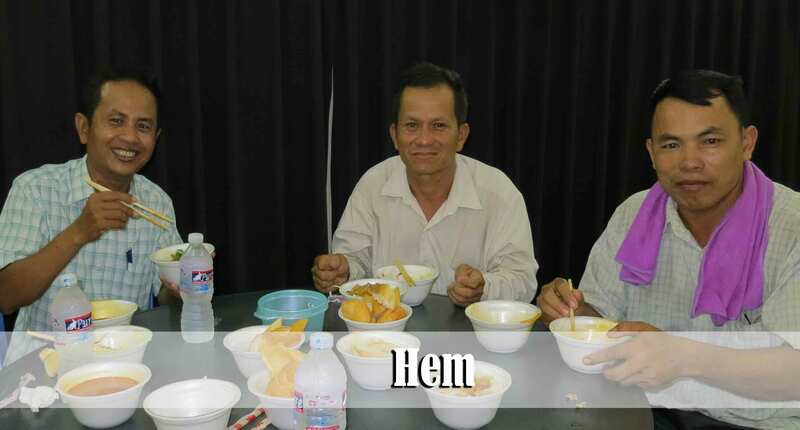 Thank you for praying for Hem and his salvation. Please continue to pray that he will grow in the Lord. This morning Debbie and I began one-on-one New Believer discipleship with SreyLeak. I taught a lesson dealing with some of the things that happen when we get saved. Today we discussed the truth of redemption and how that we are no longer under the control of the devil because Jesus has redeemed us from sin and unto Himself. (Titus 2:14) Her assignment for this week is to try and memorize the Books of the New Testament in order as well as to memorize 2 Peter 3:18 which says, “But grow in grace, and in the knowledge of our Lord and Saviour Jesus Christ. To him be glory both now and for ever.” She has only been saved a little less than two months but already shows a real hunger to grow. Please continue to pray for SreyLeak’s physical protection as well as her spiritual growth. This past Sunday, for some unknown reason, there were 70 children who showed up for the Prak Pnou village Children’s Ministry which takes place just before the adult service. We are only equipped to facilitate 40 folks so it was a bit hot and crowded. We continue to hit resistance from the adults in this village. There are a number of adults in this village who have come off and on but eventually quit once they figure out we are not going to give them money, rice, medicine, teach them English for free or do anything else to bribe them to keep coming. While there is nothing inherently wrong with providing these things to those who are in need, it is very unwise and causes much confusion when, in order to receive these items, one must attend a church service. Prak Pnou village, as in many other parts of this country, has been saturated by NGO groups and fake christian groups who bribe people to go to church. While soul-winning in this village I think we may actually spend as much effort trying to undo the damage that many of these groups have done as we do actually teaching the truth of God’s Word. The Apostle Peter address the damning effect of false teachers upon the hearts and minds of the lost in 2 Peter 2:2 where he says, “And many shall follow their pernicious ways; by reason of whom the way of truth shall be evil spoken of.” Many in Prak Pnou have been trained by these groups to believe that “Jesus” is synonymous with “free stuff.” I’m certain that we all like “free” and so I can’t really blame them. It is just sad that they want nothing to do with a Jesus that requires them to “…turn to God from idols to serve the living and true God.” (1 Thessalonians 1:9) Please continue to pray for our workers to have patience as they seek to win the lost in Prak Pnou. Thank you sister Pat. We do appreciate you and Brother Junker and your many years of faithful service. We pray for God’s richest blessing in your lives and healing of your bodies.